We are pleased to welcome you to our practice, a practice that had its origins in San Francisco and Marin County during the mid-1970's. We believe our practice is unique in the area, as our Eye Doctors, Drs. Baggett & Lovering, have had over 40 years of experience in Teaching & Research in Optometry & various Contact Lens modalities, both in clinical and University settings at California Pacific Medical Center, and at the Contact Lens Clinic at the School of Optometry at UC Berkeley. We have been in practice in Palo Alto since 1992, and have recently moved into our new practice location on California Avenue, near Stanford University and the California Avenue Cal Train Station. We are proud to present, in our new showroom, the latest in Fashion Eyewear from the studios of the finest Eyeglass Frame Designers in the world, including: 141, Aston Martin, Bvlgari, February 31st, FH One, Gold and Wood, Gucci, IC Berlin, Kate Spade, Kio Yamato, LA Eyeworks, Maui Jim, Nike, O&X, OGA, OWP, Porsche, Prada, Prodesign, Silhouette, St. Laurent, Tag Heuer, Tiffany & Co., Tom Ford, William Morris, and many more! We carry the latest fashionable & designer frames, including children's & kid's eyewear, polarized & transitions sunglasses, sport, hiking, biking, & cycling goggles, safety, polycarbonate, and thinner hi-index glasses, and the newest exclusive eyewear from the finest designers in the world. 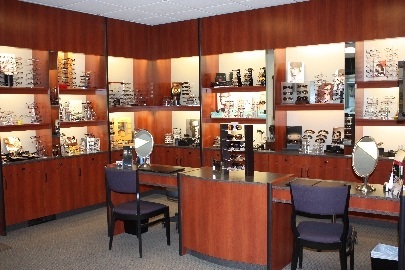 Our professional Opticians will help you choose eyewear that fits your lifestyle, and compliments your appearance. Our complete line of frames will accommodate a wide variety of single vision, bifocal, trifocal, & progressive addition prescriptions. Our extensive experience in fitting contact lenses provides you with disposable Soft and RGP (gas permeable) lenses to fit all varieties & specialties (eg. spherical, astigmatic, toric, bifocal, tinted, therapeutic, UV absorbing, silicone, keratoconic, progressive, as well as flexible and extended wear lenses), providing you with oxygen permeability to maintain ocular health and promote comfort. We proudly provide Vision Insurance service to members of VSP (Vision Service Plan), MES (Medical Eye Services), and the EyeMed Vision Care plan.